Most designers will agree that these concepts are the things consumers want their spaces to be…and lighting shouldn’t be an afterthought. Our ArcX Collection makes it easy for a space to be memorable. PMC Lighting’s ArcX Collection closes the door on boring, mainstream, linear lighting. 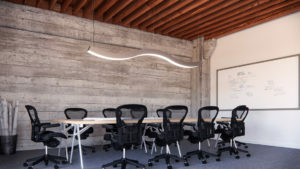 While in the past most commercial and public buildings valued utility over style, now they too can add lighting as a finishing touch to a functional space. ArcX fixtures are an attractive, exciting addition to any building. Think outside of the line…and light on the curve. 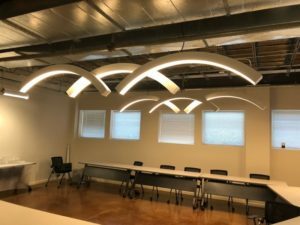 Since 2014, PMC Lighting’s ArcX Collection, created from extruded aluminum, has been proudly made in the USA, and offers options to make conceptual dreams a reality. We provide support during all aspects of the project including design, manufacture, and drawings throughout the construction process. All of PMC’s ArcX Collection are available in uplight, downlight, and a combination of both. Dimmable LED drivers are standard. With available multiple lumen packages and color temperature options, further personalization is also possible. Whether an understated luminaire or a bold fixture is wanted, ArcX lighting can keep branding consistent throughout a space. 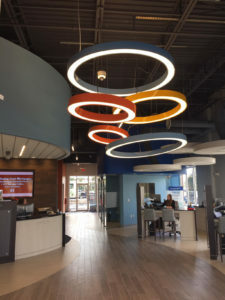 From personalized colors to a whimsical shape, a building’s lobbies, office spaces, and hallways can come alive and make a statement with modern, fresh lighting. 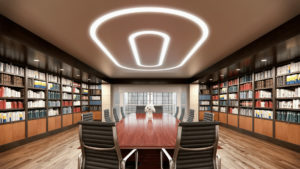 Designers can now design on both vertical and horizontal planes and create lighting that is specifically designed for a special space with almost no planar restrictions. Envision luminaires that are works of art and conversation pieces…not just utilitarian lights. What is your goal when designing lighting for a client? Is it to highlight special areas in a room or space that you want people to notice or invite into? Would you like to showcase unique architectural or design features in a lobby, conference area, or other space? Is it to welcome visitors to hotel, hospital, or office lobbies with eye-catching details that can make a public space feel warm, inviting, and engaging? PMC Lighting and the ArcX Collection can help you meet your goals. ArcX – Curved on the horizontal plane and 4″ wide. ArcXN – Curved on the horizontal plane and 2.75″ wide. ArcX2 – Curved on the vertical plane. ArcX3D – Combine ArcX and ArcX2 and curved on both the horizontal and vertical planes. ArcX BloX – Select assortment on Semi-Custom modules available for quick delivery. 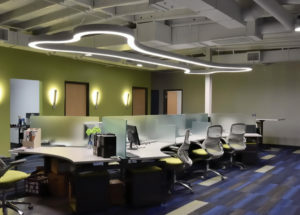 ArcX Connect – Curved and linear unlit sections to complete flowing designs where no illumination is needed.